Today was a stay-at-home day, and it was one of those unusually unremarkable days in which we got up, had our breakfast, and did our school work without much interruption. I worked with O6 on her math while S8 practiced violin, then we switched. S8 is on lesson 7 and O6 is on lesson 5, because she is content to do just one lesson a day. S8 wants to work ahead. They did their reading and finished up our other work, then we spent the afternoon doing some fall-inspired crafts. 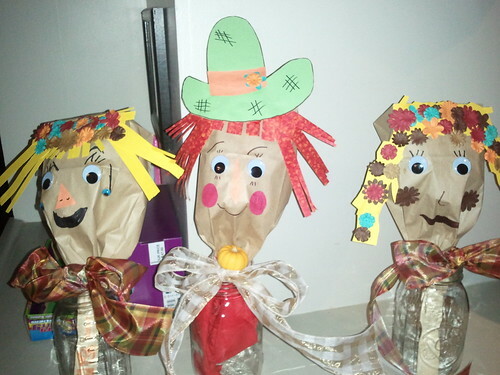 The kids made paper-bag scarecrows, which are now gracing our entryway. In the evening, I took S8 to Symphonette. This is an extra-curricular string orchestra sponsored by the Youngstown Symphony. It’s for string students eighth grade and below. S8 is sight-reading quite well and Miss Tina suggested we give it a try. S8 was a little nervous going in (but was trying to be very brave about it). In the end, though, I think she had a really good time. She is the youngest student by far, but Tina helped her with the music and she came out of the practice with a grin on her face. It’s good for her to do something independently of her sister for once. I think she will get a lot out of the experience. Posted on October 2, 2012 October 22, 2012 by JenPosted in Activity, ExperiencesTagged art, math, symphonette, violin.